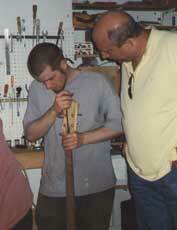 On May 17th, 2001, Dan Jackson took us to the luthier Carl Thompson. 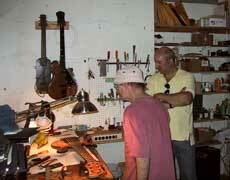 We met Carl Thompson in his small workshop in the Brooklyn district, near the famous Brooklyn Bridge. 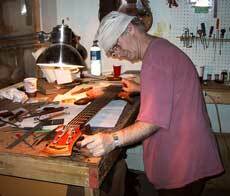 He was just working on Dan’s fantastic left hand six string bass. 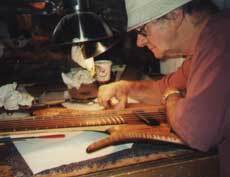 The 62 year old bass builder had to do some adjustment working on the bass neck. At first there was no chance of stopping him from doing his work. But a short time later he gave us his complete attention. Carl Thompson grew up in a musical family. His dad was a machinist / inventor kind of guy and he came up with a humbucking pickup design before Gibson – and was also experimenting with multitrack recording – the thing that guitarist Les Paul became famous for. At this time Carl’s father was building his own guitar, featuring this humbucking pickup. This guitar is hanging on the workshop wall, next to Carl’s workbench. 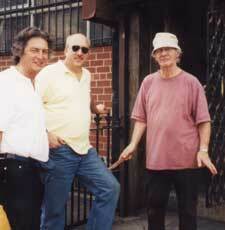 Carl was a Jazz guitarist who moved to New York in 1968 hoping to earn a living playing guitar. 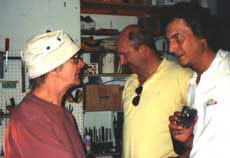 Unfortunately, everybody and their mother was playing guitar, so he got a job doing repair work in Dan Amstrong’s shop. His customers included guys like Hendrix, Clapton, Zappa, Townshend, Duane Allman, and jazz guys like Jim Hall and Les Paul. In around 1972 or so he got a gig playing bass, and borrowed a Fender bass. He didn’t like the way it balanced, so he set out to make his own, and the rest is history. During our meeting with Carl Thompson we saw the new Lightwave infrared pickup and listened to a radio interview with sound documents, including songs from his father’s band. Together with two co-workers Carl is producing not more than 10 basses a year. 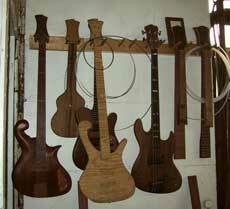 There is a great demand for his basses, but Carl doesn’t want to expand his workshop. So if you like to have a Carl Thompson bass, it takes time. You will have to wait for your bass for more than 3 years. But dear lefties, be warned. Carl told us about the difficulty of building left handed basses. He hates to build left-handed basses, and a six string left-handed bass is an absolutely unreasonable demand. I don’t know if I could believe him. But when he told us this, he was looking straight into my face with a grave look in his eyes. 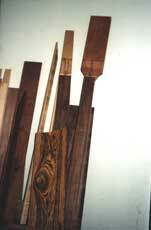 We became acquainted with Carl Thompson as modest luthier. 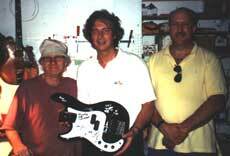 He told us a lot of times that it isn’t important to have an expensive bass guitar. It’s the musician who’s making music, not the instrument. 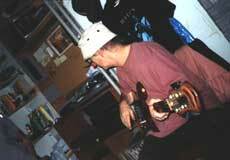 “Music is coming from the inside!” With the real feeling, you will let a Danelectro bass sing also. 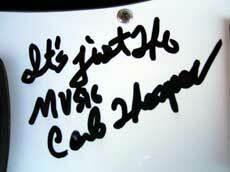 “It’s just the music.” That is what Carl Thompson signed on my bass. 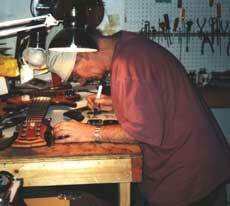 Dan Jackson's lefty 6 string bass on the workbench. Carl Thompson has to make some adjustments. This is the "horror" in form of an instrument: It's a bass! It's a lefthanded bass!! It's a lefthanded 6string bass!!! 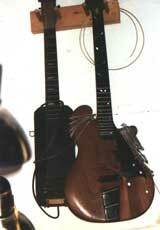 His father's guitar (left), built around 1940. 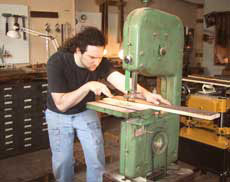 John Montalbano is working on a new bass neck. A Carl Thompson bass, featuring a Lightwave pickup system. The master is playing his own bass. A signature on my bass. It's time to say good bye to Carl Thompson and Dan Jackson. An unforgettable afternoon in New York City. 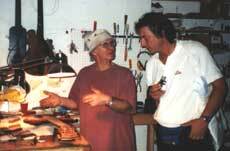 We have to say good bye to a luthier who has spent a lot of time and patience. Ahead of us is a walk across the famous Brooklyn Bridge. May 19th, 2001. What a fantastic day.